Linksys Connect software is available on all Linksys Wi-Fi Routers and Linksys Smart Wi-Fi Routers (E4200 v2, EA4500, EA2700 and EA3500). This software allows you to manage your wireless network's Security Settings, Guest Access, Parental Controls and Advanced Settings. To learn about the Linksys Smart Wi-Fi compatibility issues with Mac OS X® Mountain Lion (10.8), click here. If you would like to opt out of this free service, you may remove the Linksys Connect software. 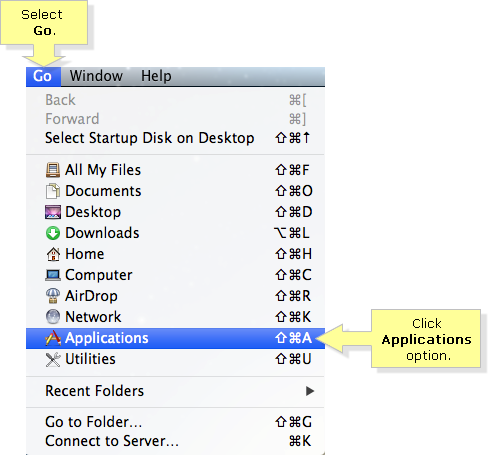 On the Menu bar, select the Go menu and click the Applications option. 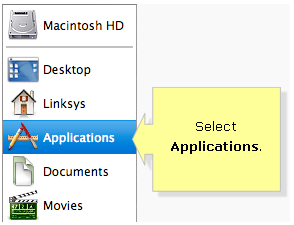 QUICK TIP: Alternatively, you can double-click the icon on your Desktop and select Applications. Select the Linksys Connect icon and press the Command key. Then, select Move to Trash from the menu. NOTE: You can also uninstall Linksys Connect by dragging its icon over to Trash in the Apple Dock. In order to restore the space that was taken up by Linksys Connect, right-click on the Trash icon in the dock below and select Secure…Trash option. Click the Empty Trash button to permanently erase the software on your Mac® computer. You should now have successfully uninstalled the Linksys Connect software on your Mac® computer.